It strikes me as rather unproductive, however, inasmuch as it stereotypes the Natural Sciences as amoral, disinterested pursuits (i.e., pure science in a lab coat) and equally stereotypes the Humanities as pseudo-theology, as being preoccupied with questions of morality and deep meaning. Scientists therefore need poetry and theater and philosophy to keep them centered and grounded–the plot of not a few sci-fi movies is premised on the dangers of science run amuck. Neither portrait, however, is accurate; legitimizing ourselves by appealing to our supposedly privileged position as the arbiters of worthwhile knowledge won’t serve us very well in persuading our academic peers that our contributions are relevant; for we’ll just come off sounding like annoying know-it-alls. But if alienating them and making Humanists feel good in what they see as their ostracized, victimized position is the goal, then this sort of nostalgia for a long lost time when we alone knew what was moral, and scientists dressed like guys working at NASA in the 1960s–skinny black ties and white shirts–might be a really good idea. 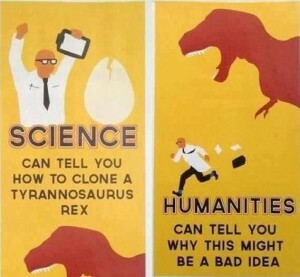 This entry was posted in Faculty Blog, Relevance of Humanities and tagged Humanities, Meaning, Morality, Natural Science by Russell McCutcheon. Bookmark the permalink. The John Templeton Foundation’s efforts to bridge the presumed divide that you critique here seems to reinforce your point. Their work often looks to be in the service of particular theological and ideological ends. You must first create the impression of a divide before you can rise above it by bridging it, meaning that uniters are, first and foremost, dividers.